Br. 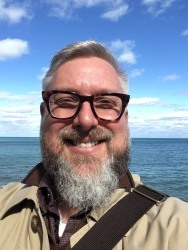 Lee Colombino, SJ is currently enrolled in the Masters in Spirituality program at the Institute of Pastoral Studies at Loyola University Chicago and he is currently assisting Lynn Sprehe and Fr. McGurn in the Bellarmine Spiritual Direction Internship as part of his studies. Br. Colombino has also taught in the Theology and Visual Arts Departments at Loyola Academy in Wilmette, IL. His studies over the course of his life are indicative of his loves: Cultural Anthropology—engaging diverse cultures that are part of God’s creation; Theology/Spiritual Life—a life of prayer, discernment, and actively engaging his journey with God; and, Art—getting messy, seeking to learn from mistakes and taking delight in ‘happy accidents’…a time of prayer and reflection.